The Chicago Plan Commission is set to approve a proposal Thursday endorsing large-scale development near the Jefferson Park Transit Center, ramping up a years-long campaign to enliven a flagging retail district on the city’s Far Northwest Side. After more than a year of demographic research and community meetings, planners working with the Regional Transportation Authority came out with a laundry list of guidelines they say would create a “hub for activities and amenities” aimed at the 20,000 daily commuters who pass through the transit center. The city recommends new retail and residential construction on the west side of Milwaukee, where the “opaque facade “ of a single-story U.S. Postal Service sorting facility detracts “from an active retail environment along Milwaukee,” according to the document. And on the east side the street, city planners will look to replace a vacant strip of storefronts with an “an outdoor plaza and/or winter garden” along with new retail and apartments. 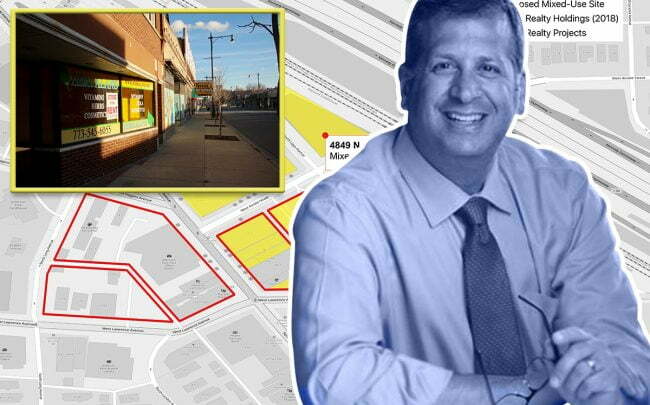 The study was sought by Alderman John Arena (45th), whose policy of wooing multifamily developers to build near the station has raised the ire of some longtime residents. Once a hub for local shops and immigrant-owned bakeries, the strip of Milwaukee Avenue surrounding the transit center is now dotted by vacant storefronts and drive-thru fast food chains. Some developers have already heeded Arena’s call, most notably Mega Realty, which broke ground this year on a 48-unit apartment building at 5201 West Lawrence Avenue and has proposed building a 114-unit mixed-use complex at 4849 North Lipps Avenue. The latter proposal, for a 16-story complex dubbed “Jefferson Place,” was granted city zoning approval last year and is now awaiting building permits. Three other apartment buildings have been proposed within a half-mile of the station, including a plan unveiled by developer Michael Loukas last month for a 31-unit mixed-use building at 4900 North Milwaukee Avenue. Jake Parker, a multifamily property broker with the Kiser Group, said the master plan is bound to throw momentum behind new construction in the area, but only when more of the proposed developments become a reality. The city can’t force redevelopment of properties without getting their owners on board, and so far neither the Postal Service nor Mega Realty, which owns the strip of retail buildings at 4801-15 North Milwaukee Avenue, has shown any sign of interest in the planners’ ideas. Source: Current holdings were based on Cook County Treasurer data. Boundaries for proposed project area were based on the Jefferson Park Station Area Master Plan. Basemap was provided by OpenStreetMap and its contributors. 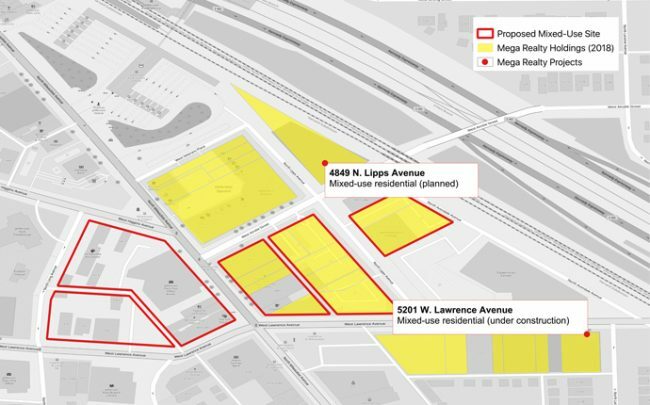 Mega owns 25 parcels inside the master plan’s “study area,” which surrounds Milwaukee between Sunnyside and Berwyn avenues. The developer paid about $832,000 in taxes on the properties last year and about $458,000 during the first half of 2018, on pace for a 10 percent year-to-year jump, according to Cook County property records. Officials and neighbors also have expressed frustration at the hodgepodge of families and small-scale landlords that own the retail strip along Milwaukee south of Lawrence, whose chronic vacancy has posed an hurdle for nearby development plans. Many of the same landlords have proven reluctant to turn over their buildings to ambitious buyers, according to local developer Tim Pomaville, whose company Ambrosia Homes has proposed redeveloping a historic firehouse near the transit center into a brewpub with apartments on top. Parker added ballooning construction costs are pushing most multifamily developers to stick to core neighborhoods like Lincoln Park and Lakeview, where they can charge premium rents. Proposals as far out as Jefferson Park may only be worth the investment if they include upward of 20 units, a scale big enough to draw a backlash from neighbors. Still, the fundamentals underlying the neighborhood should be enough for plenty of builders to buy into, especially now that the transit center is undergoing a $25 million renovation, Pomaville said.